Remember when you could go to the bar after a long day, and the bartender was there to listen and talk. If you were looking for love, the bar was the place to go to meet new people. And then there were the times when you just went to relax, catch up with friends and watch the games. The bar was a social experience where you were always welcome and everybody knew your name. But Social Media killed the bar experience. People go to bars and stare at their phones. They follow friends lives online rather than engage others in person. They take pictures of their food, write posts and seek out likes rather than talk to other people face to face. Genuine connectivity is now being replaced by artificial connections. The bar was once the center of connectivity but has now taken a back seat to social technologies. And bar operators are feeling the effect too. Their customers are paralyzed by their phones so they spend their marketing budget advertising on the large social media channels. But with so much generic information on these platforms their content is severely diluted or lost completely. And this does nothing to increase spending at the bar. The reality is customers stay longer and spend more when they are engaged, connected and having a good time. So how can the former social epicenter, the bar, adapt to the social media takeover? Enter BOTY. 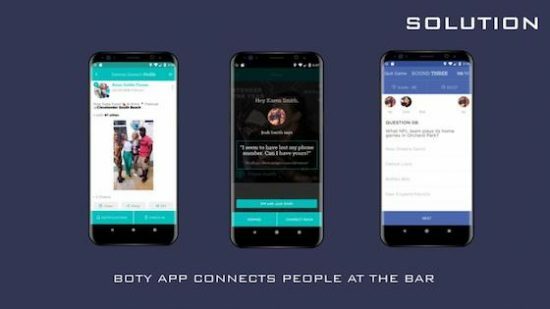 BOTY is a social technology that reconnects people by facilitating face to face interactions within bars. BOTY is a niche platform for the bar community, providing insightful data, customizable metrics and targeted advertising to bar operators. BOTY offers a seamless front end user experience with real time social feeds of each bar, which includes photo and video sharing and check in alerts. Users use the connect button to introduce themselves to others in the same bar. Play trivia, try a bar challenge and earn BOTY Points, which is a new digital currency for the bar that can be earned, transferred to others or easily cashed out to a person’s bank account. 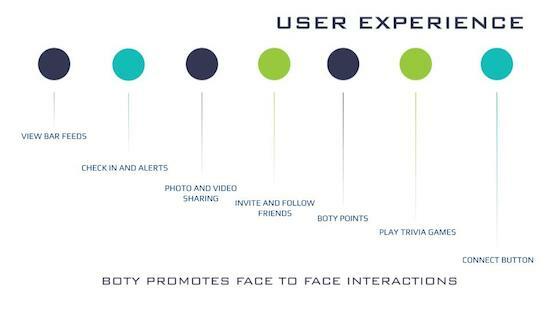 The gamification features of BOTY app enhance the bar social experience for users and create customer loyalty. In turn this offers bars better customer engagement, higher customer satisfaction and increased spending. 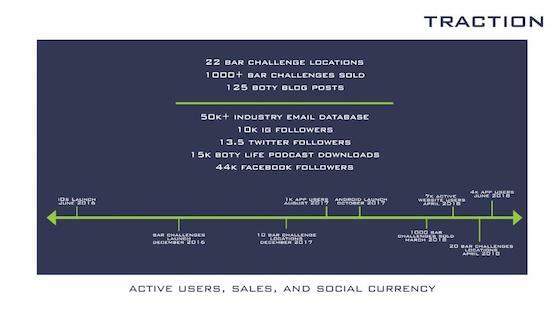 BOTY App’s presence in bars leads to an improved ratio of customer lifetime value and a higher return on investment. The Bar Portal offers bar operators invaluable data and configurable metrics about their current customers and potential customers nearby. Establishments can survey their customers with polls using BOTY Points as an incentive. Bars can also post specials and events to their feed and engage customers with direct messaging and push notifications. BOTY gives bar operators the insight and marketing tools needed to drive business and retain customers longer. We onboard app users in a variety of ways. Our most effective approach currently is running ads on the App Store and through Google Adwords. Our cost per install is under $1. 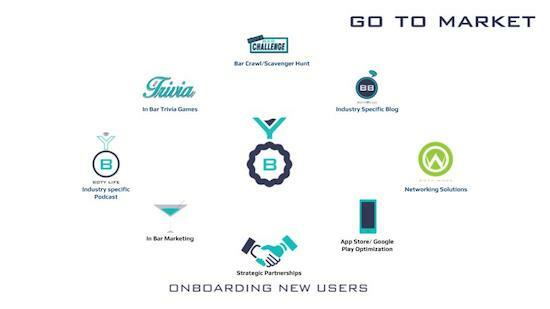 We have also had success onboarding users at live Trivia events and Bar Challenges across the country. BOTY launched on just IOS in June 2016. Up until we launched on Android, the majority of our efforts were spent developing, testing and fixing the technology. Once we launched on Android in October 2017, we have been adding new users at a rapid clip with a minimum marketing budget. BOTY has huge social currency with a strong online and social media presence. BOTY is one of the top industry resources with a large audience and following for it industry specific blog and podcast. We have cultivated an email database of over 50 thousand bar enthusiasts, operators and bartenders. The front end user experience is available for free. 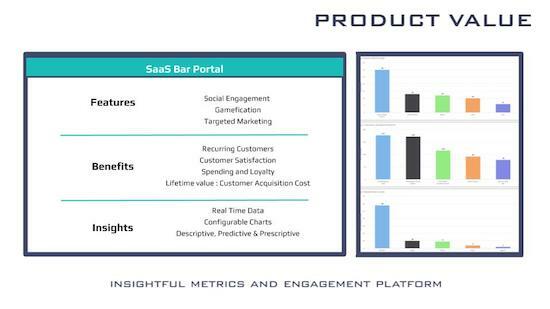 Bar operators gain access to data and engagement capabilities for a monthly subscription cost. This SasS platform is available to bar operators as a self service dashboard with configurable metrics. Additionally, bar operators can purchase add on features to host on demand trivia games, request secret shopping and utilize an industry specific recruitment and hiring portal. 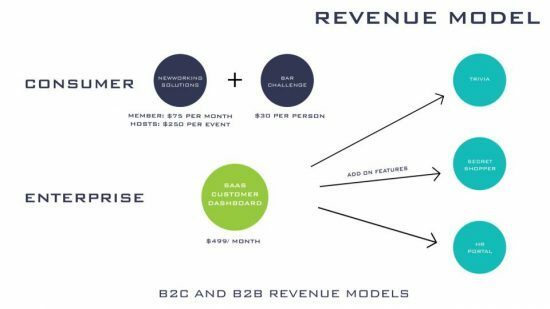 Additionally, we bring in revenue through our 3 user engagement verticals, the Bar Challenge, Trivia and Networking Solutions. Now we do have a lot of competition for individual aspects of BOTY, however there is no other company that combines all aspects of BOTY. Our niche platform for bars is heads and shoulders above the rest as we improve face to face experience at locations. BOTY competes with traditional and tech trivia companies however to our knowledge we are the only company that combines trivia with user data and engagement features. 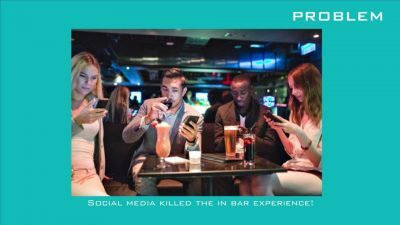 Bar operators currently spend the majority of marketing budget on social media advertising but BOTY offers them a niche platform with better reach to their targeted markets and a higher return on their investment. For the front end app users, BOTY is in competition with traditional social media like facebook and instagram. We use the same social features we all know and love but with BOTY its live, in person social media in social spaces – the bar. The same is true for social dating companies, instead of swiping at home we give people the technology crutch of viewing who else is available in the same bar but our Flirt button creates a soft opening to walk up and introduce yourself in person. I have built two successful homecare businesses, where I managed over 200 employees over the past twelve years. Our CTO JC is focused on high customer engagement and a well thought out technological roadmap. Jenna, our sales and marketing coordinator, is also a domain expert with over 10 years experience in the bar industry. Our core team for BOTY has been in place since the beginning. 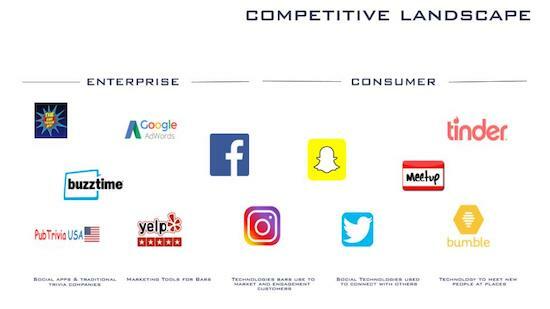 The combined talents covers many areas especially technology, marketing, finance, and hospitality which makes us uniquely suited to dominate this industry. 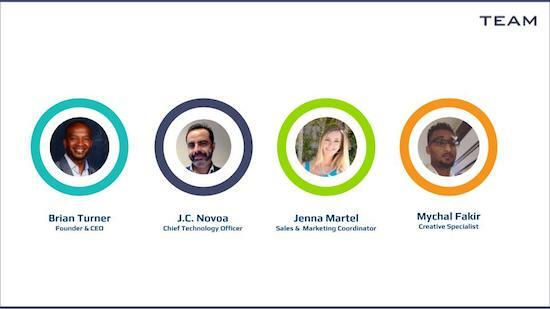 With the right investor partner, we can scale our marketing campaigns programs and increase the reach of our sales efforts. We will also grow the team and further enhance the technology. Thank you and please download BOTY. 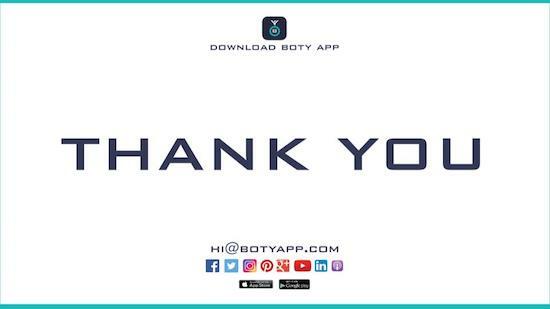 Please contact us at hi@botyapp.com with questions or to arrange a follow up meeting.